So, what exactly is this Bitcoin “investment”? Is it worth $300, $3000, $10,000, $15000, $60,000? What is the fundamental (intrinsic) value of an intangible and unregulated asset backed by absolutely nothing? I will let you decide. If you believe it is worth more (say $60,000) than the current (and declining) price of about $14,500, then mortgage your house and wait for it to reach $60,000. DISCLAIMER: I, along with others see the intrinsic value of this intangible asset backed by nothing at best “undefinable” but in my opinion, zero. Do not mortgage your house to buy more while it is now “cheap” until you have a firm understanding of the fundamental value, if there is any. Nevertheless, as expected, regulation is coming. This already has adversely impacted the “value” of bitcoin. Enjoy the roller coaster! The rout in bitcoin is also taking down stocks with ties to cryptocurrencies. 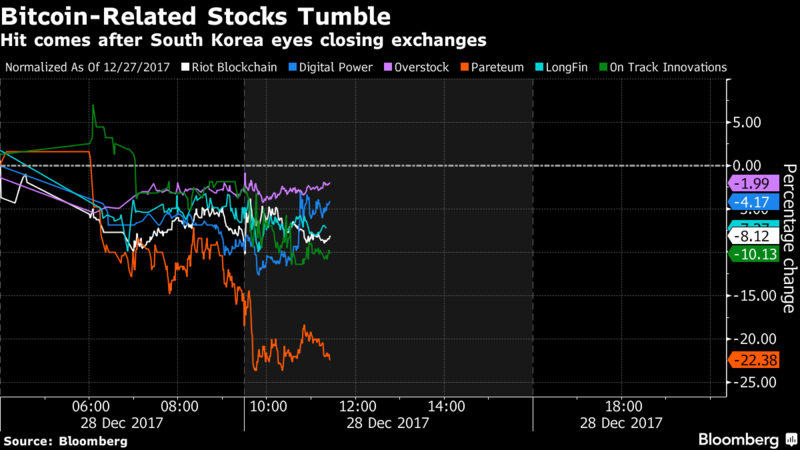 Pareteum Corp. dropped 26 percent as of 1:13 p.m. in New York, while Digital Power Corp. and LongFin Corp. each slipped more than 6 percent after South Korea’s government said it wanted to clamp down on speculation, potentially by shutting down some exchanges. The warning sent bitcoin below $14,000, leaving it down 29 percent from last week’s record. Overstock.com Inc., On Track Innovations Ltd., and Riot Blockchain Inc. also traded lower Thursday, in relatively light volume during a holiday-shortened week. The crypto space has been on a wild ride this month, with the digital token bitcoin soaring to record highs before a dramatic selloff last week. The assets rebounded earlier this week, before resuming their slide lower in a test for investor enthusiasm in the asset class. Such volatility isn’t new for bitcoin or its proxies. The digital coin has seen many peaks and valleys over the course of its history. This year, it’s climbed 1,300 percent and once reached more than $19,500. Related assets have largely moved in tandem with the cryptocurrency. Shares of Riot Blockchain and Digital Power, while taking a hit today, are still up 611 percent and 475 percent this year, respectively.